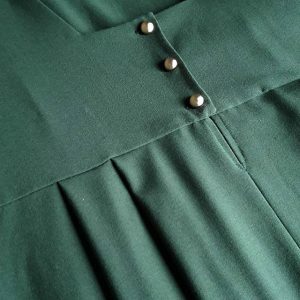 Make a 1 cm (3/8 in) pleat, wrong sides together, along the bottom edge of the back Facings. Press pleats. Overcasting of the edge will maintain the pleat on one side (here only some stiches, red arrow). 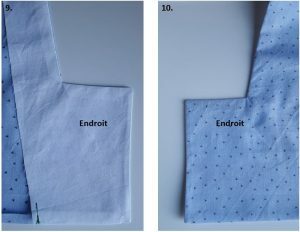 Place the Facings on the corresponding Back pieces, right sides together (“Endroit”= Right side; “Envers”= Wrong side). Completely unfold the bottom edge of the Facing and sew the two pieces together. At the bottom, stop sewing after 7 mm (1/4 in). 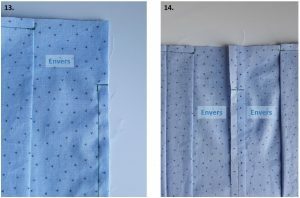 For a larger placket, sew closer to the edge. Seam allowance will be reduced. 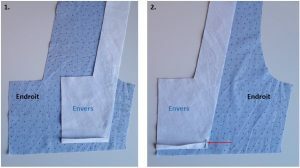 Clip corners, trim down seam allowances (except for enlarged placket). Turn garment right side out. Gently push the corners to sharpen the point and press carefully. At the bottom of this piece, you should have a small corner closed on 7 mm (1/4 in). Sew the two back skirts (with pleats), right sides together. 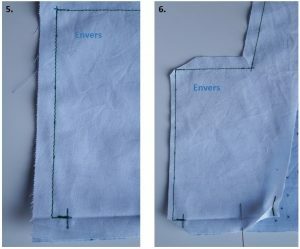 Start your stitching 6 cm (2 3/8 in) from the top edge of the skirt pieces. 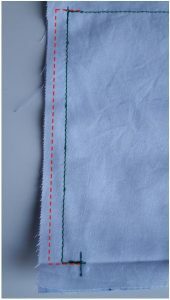 Stitch seam allowances in place a few millimeters from the edge, along the 6 cm (2 3/8 in) you previously left unsewn. Sew one piece of Back (main fabric) on the corresponding back skirt, right sides together. 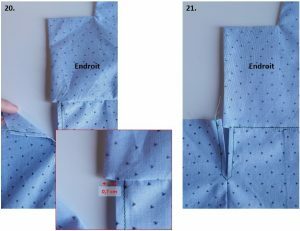 Start sewing after the small corner (Picture #18), red arrow indicates the center of the skirt under the back piece. 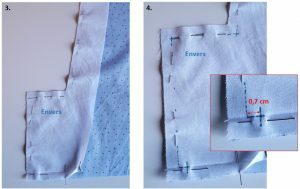 Finish seam allowances together using a zig zag stitch or an overlocker, making sure you place them right under the back facing. 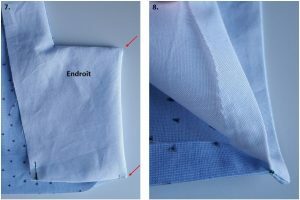 Make a few stitches to help maintain the back facing in place (folded over 1 cm (3/8 in) towards the inside) over the preceding seam allowances. 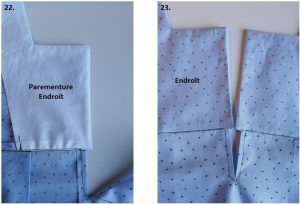 The two back pieces can be overlayed to create the buttonned placket (width = 1,4 cm (9/16 in)). 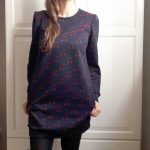 As mentionned above, you can create a larger placket. 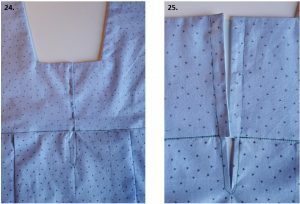 Shorten the back Bodice pattern piece by 1,7 cm (11/16 in) from the center and cut on fold. 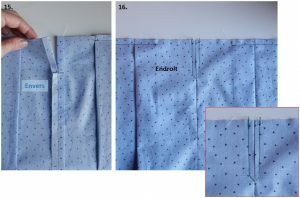 Shorten the back Skirt pattern piece by 1 cm (3/8 in) from the center and cut on fold. Then simply connect Bodice to Skirt, right sides together. I hope this tutorial will be useful!